Add storage and elegance to your home with one of these free woodworking plans. Build or design your own using these free plans. Display your favorite books and nicknacks. 15 Free Woodworking Plans found in the "Shelves / Bookcases" Category. According to BlackandDecker.com this project is an easy woodworking project that will take you approximately 4-8 hours to construct. Try upgrading your basement or garage with the free woodworking project from BlackandDecker.com. They have all of the information such as material list, tool list, and cutting list for each piece. Also check out their 10 step guide filled with pictures and useful tips on how to construct this project. A detailed cut list, detailed drawings, and excellent written instructions make this free woodworking plan an easy project to build. Add this beautiful mahogany entertainment center to your collection. If you want style and space is a concern, try building this compact entertainment center. This is an intermediate woodworking plan that you can build with only a few tools. Brought to you by the Canadian Plywood Association, this plan has excellent detail and clearly explains the construction process. This small, wall-mounted corner cabinet is very handy for storing cups, glasses or other items in a room where space is at a premium. 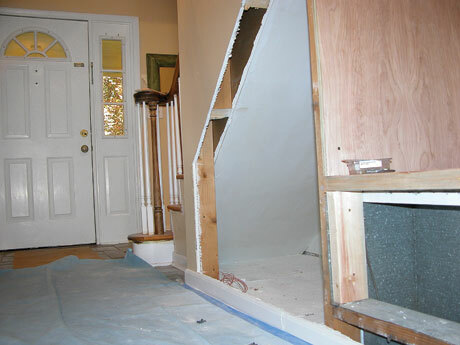 How to Build New Storage Under Your Stairs A pullout bin and new seat clear entryway clutter.